Parents of little Lego lovers, brace yourselves, as a new invention on the market is sure to have those colourful building blocks of wonder in more places than it ever has before. A duo of industrial designers have created Lego compatible adhesive tape called Nimuno Loops, which gives a whole new level of flexibility to the pint-sized plastic pieces. The invention comes completely independent of Lego but has been catapulted into reality by an overwhelming wave of public support and funding. Why is everyone next level excited? Nimuno Loops promise to allow children, and the young at heart, to take their Lego as far as their imaginations will go. No toy needs to be left behind! 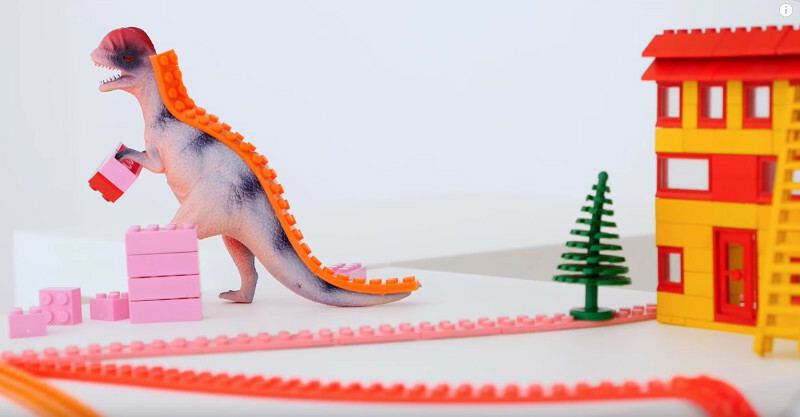 Even dinosaur figurines can now don Lego harnesses, electric train sets can intertwine with Lego towns like never before, and walls, shelves, wrists can all be adorned in building block wonder. Perhaps the most exciting part (at least for my feet), is that as Lego starts appearing on all new surfaces around the house, there may be less painful plastic minefields left on the floor. And the tape isn’t just for Lego but is also compatible with most major toy building block systems including Mega Bloks and Kreo. Check out Nimuno in this short Youtube video. Cape Town designers Anine Kirsten and Max Basler posted their creation to Indiegogo in the hope of raising US$8000 (approximately $10,400) but received 110 times that. “We need your help to bring Nimuno to life,” they wrote. “We’ve worked long, hard hours to take Nimuno from concept to working prototype. After more than a year of development, we’re confident the product is ready for production. Considering the worldwide popularity of Lego it is no wonder the flexible and cuttable tape attracted more than 21,000 backers. But no one could have predicted the funding call would raise US$880,000 (more than $1.1 million) with still have a month left in their campaign. When can you get your mitts on Nimuno? Nimuno Loop surpassed the fundraising goal and is available for preorder from the Indiegogo site. The first shipment is expected to take place in July, with delivery to Australia starting at around $12. There are a variety of packages available, with two roles selling for around US$11 ($13) or 10 for US$50 ($65). We would love to know what you think about Nimuno Loops.